A job is assigned to a group responsible for the job or part of the job. A manager may want to assign multiple jobs to a user who would complete part of those jobs. A user may need to assign a job to him or herself. A quality control analyst would want to automatically assign the data editing step to the same user who did the editing. There are several ways a job can be assigned in the above scenarios, using the job view or the workflow view, or automatically by the workflow. There are options to manually assign the job from the ribbon itself or by changing properties within the view. The various ways jobs can be assigned manually are discussed here. Job assignment is a privilege-based activity. If you are unable to assign jobs to yourself or others, contact your Workflow Manager administrator. A user may assign a job to him or herself in the job view. Open the job view for the required job. On the Job tab, click Assign To Current User . The job open in the job view is assigned to the current user. A job can be assigned to a user or group in the job view by changing the descriptive information. The descriptive information about the job is displayed in the job view. In the Job Details group, browse to Assignment. Click the drop-down arrow and choose the name of the user or group. The job is assigned to the selected user or group. To update the properties of one or more jobs in the workflow view, highlight them in the job list and click the Job Properties button on the ribbon or from the job list's context menu. This will open the Job Properties pane, where you can update properties for the highlighted jobs in the job list if you have the required privileges. If it is not possible to update a job after clicking Apply, an explanation can be found on the Notification pane. A job can be automatically assigned based on who executed the step. The information about who executed the step or marked the step as complete is stored by Workflow Manager. When a previously executed step becomes current again, the job is automatically reassigned to the person who executed it or marked it as complete. 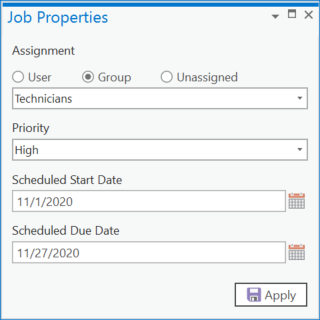 If the step needs to be assigned to a user or group other than the person who earlier executed the step, path assignment can be used to change the job assignment as required. If the path assignment is configured to assign the job to a group the current user is a member of, the job assignment is not changed. The job stays assigned to the current user executing the step.